Russia accuses Georgia of supporting a terrorist plot against the 2014 Sochi Olympics, organized by rebel leader Dokku Umarov. TBILISI, DFWatch – Russia’s national antiterrorism committee says it has foiled a terrorist plot planned against the Olympics Games in Sochi in 2014. The committee also says a significant arsenal of weapons was seized. “The ringleader of an international terrorist organization ‘Caucasus Emirate’ Umarov, maintaining close ties with the Georgian special services, coordinates all the activities of the organization of delivery of the commission of terrorist acts in close proximity to Sochi and bookmark these caches,” the committee’s statements says, as quoted by Ria Novosti. Three persons were arrested in the operation, which took place in Abkhazia, a region which broke away from Georgia in the early 1990s and was later occupied by Russia. The committee says that militants were planning to move the weapons to Sochi sometime before the games open in 2014 and use them to commit terrorist acts during the preparations and during the games. Russian media describes the arms seized as three portable anti-aircraft missile systems, “Needle” and “Bolt”, two antitank guided rockets, and 36 mortar shells, as well as a “Bumblebee” flame thrower, 29 grenade launchers of various caliber, 12 improvised explosive devices, 15 antitank and antipersonnel mines, 655 rounds of grenade launchers, 39 grenades, 50 fuses, a sniper rifle and two submachine guns, 15 pounds of TNT, more than 10 000 rounds of ammunition of various caliber, as well as topographic maps. Nikolay Makarov, a member of the Duma’s security and anti-corruption committee, confirmed that the national antiterrorism committee claims that Dokku Umarov, a Chechen rebel leader, has close relations with Georgian special services and that this statement is not baseless. “Everything is based on operative material, which is objective,” he said, adding that the terrorists are being helped from abroad; otherwise they wouldn’t have been able to operate. “They buy explosive material and weapon with means received from abroad, and what’s important, they find executors. It’s unemployment in Caucasus now. Youth is doing nothing, and they are even ready to commit crime if they will be paid for this,” he added. The Georgian interior ministry responded by saying that the accusations are groundless, and that the Russian government is trying to mislead the international community and escalate tensions in the region. 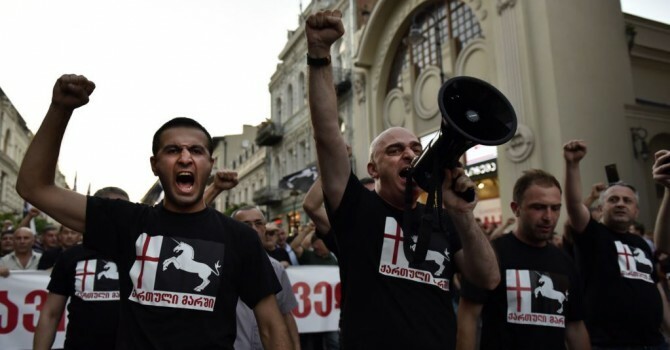 The ministry called on the Russian government to stop issuing these provocative statements and help Georgian law enforcement bodies to investigate terrorist acts. Sergi Kapanadze, Georgia’s deputy foreign minister, also responded, saying that it is continuation of Russian propaganda. “The last year, there were fifteen attempts to implement terrorist acts on the territory of Georgia from occupied territories,” he said. He also says that Russia always refuses to present appropriate evidence to prove their accusations. Dokka Umarov is known to have implemented numerous terrorist attacks and is also known as “Russia’s Osama Bin Laden”. He’s the first Emir of the Caucasus Emirate and fifth President of the Chechen Republic of Ichkeria.